May 18, 2016, 8:00 in the morning. The cold prevails despite a forecast temperature of 38 degrees for the day. I walk through more than one km of mesh tunnel in a deserted area with automatic gates. Green light, we can pass. Red light, we wait. Not a soul in sight, all visible traces of humanity seem to have disappeared. This place outside of time, of space, is Erez: the border that links Israel to Gaza, Gaza to Israel. A hyphen between two worlds. Gaza, a strip of isolated land about 360 km2, 40 km long and 6 to 12 km wide and where about two million people live. It is one of the most densely populated regions of the planet. Faced with an average of 5.7 births per woman in the region, and additionally subject to a blockade, it cannot meet the needs of a population that is growing rapidly. Schools are overflowing and basic infrastructure such as electricity, water, sanitary installations and social services are insufficient. Wars, the last of which took place in the summer of 2014, have bled the strip dry. The people are hurt and desperate. Water is lacking and power cuts are long and frequent. Extreme poverty is visible, the unemployment rate is very high, and income per inhabitant is very low. Eighty percent of the population lives below the poverty line and depends on external aid. An entire generation of Palestinian children have grown up there. They have seen a lot of misery, war and imprisonment. Under 18 age group represents almost fifty percent of the Gaza population, and they cannot see life with a future. Caritas is present in Gaza, a 20-person-strong team who help the most deprived people through numerous projects they put in place. The medical centre of Caritas, set up in an extremely poor neighbourhood, is always full. There is a gynaecologist, a dentist, a general practitioner and a pharmacist helping the most vulnerable families. Meanwhile, Caritas mobile clinic assists families in the most remote zones. During the war in 2014, Caritas was one of the first organisations to intervene helping 10,000 families. Today, Caritas assists the most deprived children and families traumatised by war with medical, nutritional and psychosocial aid. Through an active partnership with 10 community-based organisations (CBOs) in Gaza, Caritas works closely with local population. Caritas medical and nutritional programme provide children with anaemia, a prevalent heath problem in Gaza, an appropriate nutritional supply over some months to help them recover. Caritas also ensures that anaemia continues to be considered and dealt with on a wider scale by other organisations or the UNRWA. The psychosocial programme is based on the CABAC, a well-defined programme of psychosocial intervention which targets children in armed conflicts. This project has had some big successes in the families and communities that I met. I could see children get better. They are feeling more dynamic and are able to concentrate and study better at school. 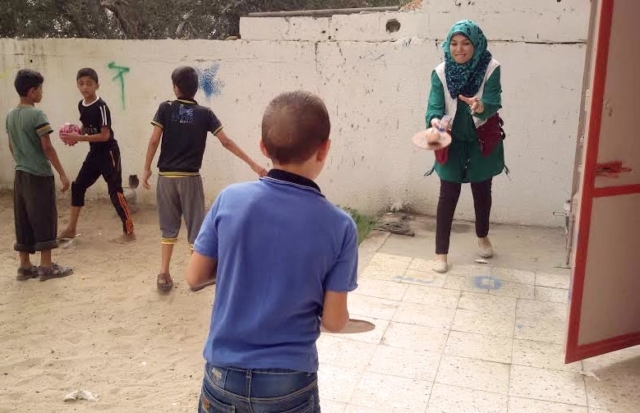 Their aggressive behaviour has declined and their apathy has transformed into curiosity and even joy, a rare commodity in Gaza. 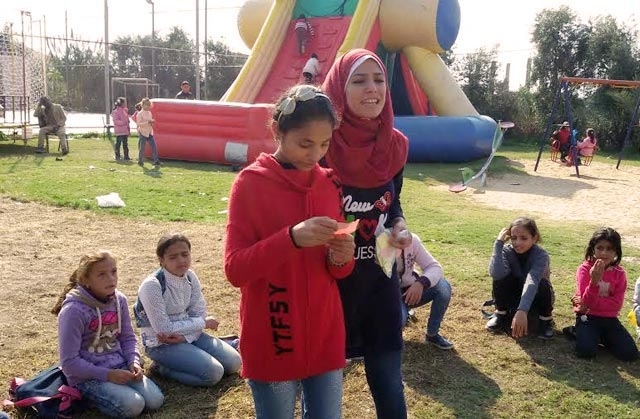 The project showcases the importance of mental health for children of Gaza. The scars of war and the blockade are felt at all levels there. “What future do you want for your children?” I ask mothers. Some answers are along the lines of “I want my child to be able to grow up like other children in the world” or “that they live in a country at peace”. Other responses focus on the immediate need for aid that they require for their children – A place to stay, food to eat, and clothes to wear today. Who knows what will happen tomorrow? One does not emerge from Gaza unharmed. One leaves with a heavy heart, with a need to breathe, to move, and a big desire to scream. I feel all these after just two days being there. What could it be like for these children, these men and women for whom imprisonment, boredom and misery is a daily struggle? Sister Briget, coordinator of the Caritas project in Gaza, described a depressed population to us, hopeless, on a drip and for whom life conditions can only lead to a growing hatred. Some wonder what will become of the young generation. The imprisonment that prevails over Gaza is a new experience of humanity. It is legitimate to ask the question of what kind of future we are creating for Gaza?